What's New in December 2018?? Well Thanksgiving is here, we have had a interesting month. Our Grandson Brayton joined the Marine Corp ( following in his great grandfather's Myrl Dean Thomas and his uncle Gordon Glenn Thomas Jr. footsteps) we saw him sworn in and hung out with him at the Airport Until his flight left to take him to Boot Camp. That was fun for Adam. Mom add Me. We are still raking of leaves on our property, and we got our first snow. This week has been interesting, Adam's friend Kent asked if I could fix his MBP 13's keyboard (replace it with a new one he purchased), I said yes, so I carefully took his machine apart and replaced that keyboard, the battery won't hold a charge. and the new keyboard would not type the q,w,e,r,t,y,u,i,o nor did the left hand side tab button work, the DVD drive did not work either. I did not check the MBP before I swapped the keyboard. So I swapped out the machine from one I got off EBay. I moved the hard drive over to the newer machine and got Kent back up and working, upgraded him to high Sierra MacOs upgraded his Ofice for Mac to version 2019. I only asked him to pay for the replacement battery. Then the next day 2 of my Mac's went on the fritz one of my MBA 13's display won't light up, and my MBP 17 won't boot up. The MBP 17 system board/ GPU seems to be bad, so I pulled that and sent it off for repair. Found a MBP 17 on EBay that I bought that has a bad battery so I replaced that and hooked up the DVD drive cable and got it up and humming quite well.. The MBA could be a bad system board as well off to search for a newer one..
Running Windows on MAC OS X (Mojave at the current time) Updated! 1. Bootcamp, allows a use to setup a seperate disk partition on you MAC (intel based only). This work well execept you must reboot you MAC to get to windows to run. 2. Parallels application (uses the virtual machine method) is a good product (I have been using Parallels since release 5 current release is version 13.x) it allows you to launch windows with in OS X. The current release is version 13 it supports Windows up to Win 10. The product support is good. Cost of the product is about 80.00 with release upgrades for 50.00 (49.99). Why are upgrades needed ? As Mac OS X is upgraded so also must Parallels. Other costs? Yep you must purchase a fully licensed copy of windows to install as a virtual machine. Parallels has better performance in OS X. It works best on Mac's with lots of ram and disk space. Win 8.1 runs very well in Parallels 9! Windows 10 works very well on the Parallels 12 and 13. 3. Fusion (VMWare product) application ( uses the virtual machine method) is a good product as well ( I have been a beta tester for a couple of releases) it also allows you to launch windows applications within OS X. The current release supports Win 7 with Windows 8 in testing. The technical support at times is lacking since VMWare first released Fusion. in the latest release that supports High Sierra has been performing pretty well . That said it is now stable. Cost of the product is about 80.00 with release upgrades for 50.00 (49.99), why are upgrades needed? As Mac OS X is upgraded (new releases) so also must Fusion. Other costs? Yes you must also purchase a fully licensed copy of the windows operating system to install as a machine. Fusion performance on MAC OS X is good (at best lots of crashes have been reported). The more ram and hard disk space you have on your mac the better. 4. Virtual Box (Sun Micro/Oracle) is an open source application (zero cost) that also uses the virtual machine method. Virtual box runs well on MAC OS X an allows for windows application to be launched from within Mac OS X. it supposrts Windows (NT 4.0, 2000, XP, Server 2003, Vista, Windows 7, Windows 8, 8.1, 10), DOS/Windows 3.x, Linux (2.4 and 2.6), Solaris and OpenSolaris, OS/2, and OpenBSD. Virtual Box also requires a licensed copy of the guest operating system to be installed. Support is better than Fusion and requires about the same amount of ram and hard disk space as Parallels and Fusion. 5. Crossover application is unique it actually installs it's own version of windows that has been optimized for MAC OS X (it also is only supports Win 95, Win XP, Windows 7, Vista, Server 2000, Server 2003). It uses what Code Weavers calls the bottle method (from the Wine origins). Applications are install via one of two methods via Cross tie application from with in Crossover (Codeweavers have lots of applications ported to run already) or via the standard exe file or cd rom method of installation. Pre configured applications (bottles) install all of the required windows apps and services as part of the installation process. Costs flexible from 39.99 with 1 month of support (no telephone support email only) to 59.99 12 months of email support with one free phone support incident. Performance is great! New version is release 13.70 it has been running great. I have tested each one of these applications on several different Mac's in many different configurations. Good luck and I hope this helps out. Crossover has been updated to 17.x and runs much better on 2009 and later Intel Mac's (including MacBook Air products). So if you have to run windows apps give CrossOver a try. Well I wanted to start with the U8 smart watch I bought off of Geek one of my favorite places to by stuff. The unit I got won't power up (bummer) getting a refund on this puppy as soon as geek support sends me the how to's. I got my GV9 watch on Saturday from Geek, so far it is pretty nice, its really built for the Android user (since it can be a phone as well!) it will connect to a iPhone 5 or better via bluetooth but there is not an app in the App store that works with it. You can get some things off your iPhone like you last numbers dialed bluetooth audio. Overall the GV9 is very nice bit of kit! I have now using a Apple Watch 3 which I am really impressed with! It works with a ton go iOS apps on my iPhone 8 Plus. Want to painlessly unlock your AT&T iPhone without jail breaking? If the answer to the question of above is yes, then continue reading. As most of you know I am a long time AT&T customer (since my first iPhone) and I travel a fair amount for business (USA and Canada). What I am tried of is having to pay roaming charges when I am out of the USA, so what to do? 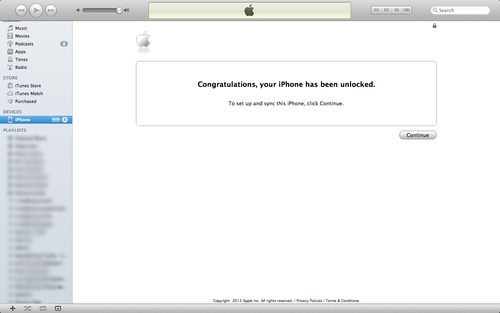 Well I found UnlockStreak.com online for a small fee they will unlock any iPhone on the AT&T network (and only the AT&T network). This does not get you out of your contract but it does allow you to when needed use a non-AT&T micro-sim from a different carrier to avoid heafty roaming charges on the AT&T network. One important note: although UnlockStreak performs a permanent unlock, the service only works if the device is tied to AT&T. For the vast majority of people using AT&T, an unlock will probably never matter. But if you’re someone who does need an unlock—and for whatever reason doesn’t want to make the jump to Verizon—then UnlockStreak is a bargain, and one that doesn’t require you to navigate the shadier portions of ebay, where many iPhone unlock offers come across as something less than legitimate. If you’re planning a trip abroad, or just need to use your iPhone on a different carrier here at home, UnlockStreak is worth a look. I can add a unlock site company that you SHOULD NEVER USE iPhoneIMEI they are crooks, and thieves. They say they will unlock your iPhone for Free its not they start at $29.97 then tell you phone has been locked by your carrier for not being paid for (I paid cash for my iPhone6s plus directly from apple) and then tell you it will cost $149.00 plus to unlock your phone.. FYI I contacted my carrier (AT&T) they said that they and nothing flagged on my phone our my account that would stop it from being unlocked, and they unlocked my iPhone for FREE with in 24 hours. To top it off iPhoneIMEi has a 100% NO REFUND POLICY again they have this in writing on their site but it is extremely difficult to find! BUYER BEWARE!